We are pleased to announce our latest pop-up project: YES PLEASE! 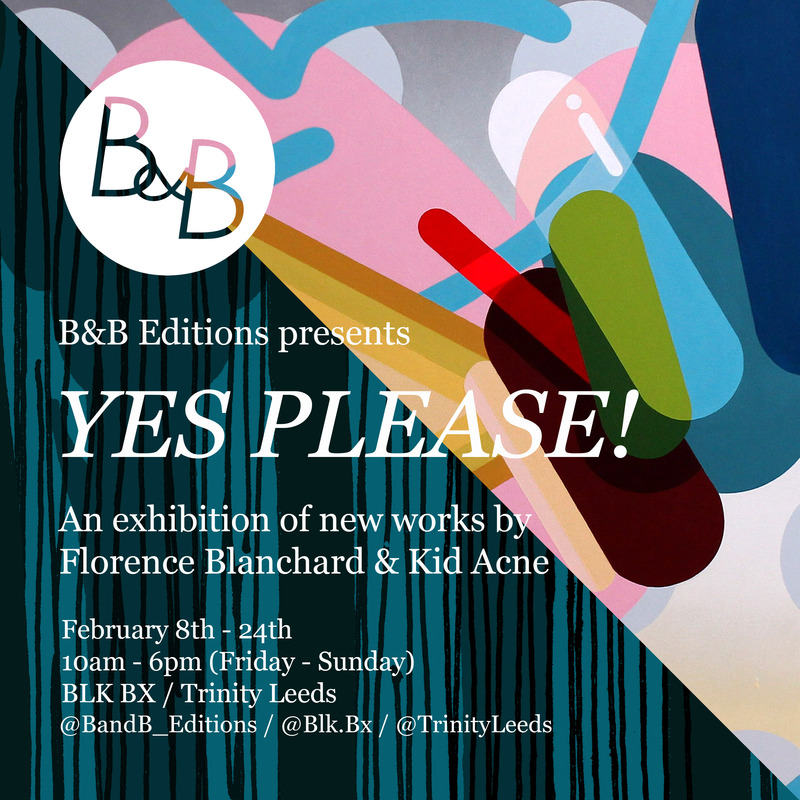 Starting from this Friday, new original paintings and rare hand-printed works by Florence Blanchard & Kid Acne will be on view for three weeks at BLK BX x Trinity Leeds . The two person exhibition is supported by additional prints and Artist Proofs selected from the B&B archives, presenting some of the studio's favourite collaborations and most popular graphics. B&B is an artist-run online gallery and screen-printing studio founded in 2013. Based in Sheffield, South Yorkshire, we promote the work of emerging and established contemporary artists through collaborative editions, exhibitions and projects around the world. Florence Blanchard grew up in the South of France where she began writing graffiti in the early 1990’s. She later moved to New York and spent 10 years studying science at New York University. Now based in the UK as an established muralist, painter and print-maker, Florence produces work inspired by her past experiences as a scientist and graffiti writer. She creates abstract molecular landscapes, which question our idea of visual perception. Artist, illustrator, print-maker and emcee, Kid Acne is a stalwart of the international Street Art movement. Born in Malawi and raised in England, he spent his formative years writing graffiti, self-publishing fanzines and making experimental hip-hop. Rendered in a distinct illustrative style, his work can be seen throughout the globe in murals and gallery shows from Tasmania to Azerbaijan. And he still has acne.